Keep track of what you have filled your barrels with. 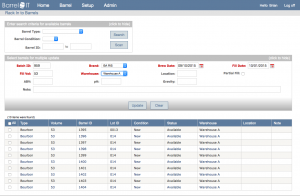 When racking in, pick your barrels by type, condition, or by scanning them. 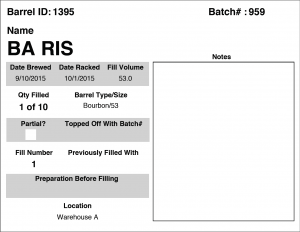 Then specify your batch information and print out all of your barrel batch detail labels. Choose barrels for racking in to. Printed batch detail barrel tag. 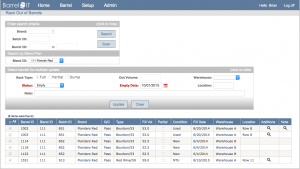 When racking out, you can search for barrels, upload scanned barrels, or just pick a blend plan. You can also track when you pull beer to fill that special pin or firkin. When racking out, you can set a barrel status so you know if you need to treat a barrel before it is available again for use. Choose barrels for racking out of. 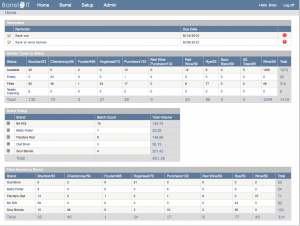 All of this data is used to populate the dashboard information, which you see right when you first log in.